I just returned from a tsunami memorial service on the beach. It was a multi-faith event, but I happened to walk up when the Christian speaker was saying how bad things can actually be good things in the end and invited everyone present into the house of Jesus Christ. The Christians from his group were wearing all black. The hypnotic blue sea, the white expanse of sand with palm trees seemed somehow entirely too sweet and wonderful for this kind of ceremony. As if nature had not a clue what it has done. The Buddhists monks wore orange, and their audience was wearing white and more cheerful colors. They proposed to say blessings that would release the spirits of the victims to heaven and purify the sand and water. They had a festive meal set out for everyone after the ceremonies. Walking over, I noticed a memorial of incense and candles in rings in the sand. This, from the night before, but the gusty winds had blown the candles out. Nature wasn't cooperating at all. 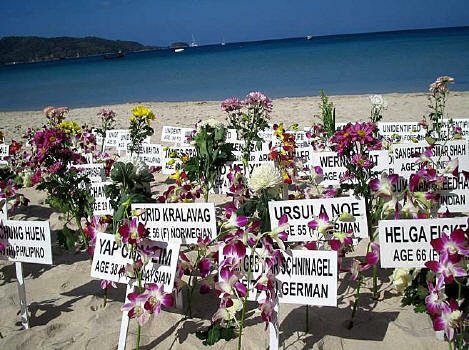 I looked over the cards placed near the water with name, age, and country of origin of victims. Written in English and Thai. Maybe a hundred names. Adorned with flowers. My camera memory card was full when I tried taking a picture of the wire tree, beside a Buddhist saint, that people had clipped money to. The king of Thailand was fluttering about on every bill. Then I turned and walked back to this internet shop for some cool water. If Jesus could walk on water, could he then step over a tsunami? When I first arrived in Phuket three days ago, the most striking thing was that there was no particular evidence at all that anything was wrong. The first night I walked from my hotel, where I'd parked my bags, and headed toward the ocean. I had been planning a recovery from my mistaken marriage and many people had said how truly beautiful Phuket was. I'd never been here. So, I bought my ticket well in advance. Before the tsunami. Anyway, here I was, with an uneasy feeling — Goodness! Disaster is following me everywhere. But honestly, I had to look carefully to find signs of the disaster. I noticed sand blasted onto the glass of a telephone booth. At the beach, I noticed the walkway was broken here and there, and there were signs of heavy scraping. But the palm trees seemed undisturbed. The beach looked perfectly fine. Along the beach most businesses were closed but some were already reopened. But it didn't look too bad. It looked like an economically depressed area. The thing I did notice was the absence of tourists. This is entirely unscientific, but I'm going to guess that the numbers of vacationers was 20 percent of what it would normally be. Today, Saturday, it seems up to maybe 35. So, let me think. The tsunami struck on the morning of December 26th. Many people came to help, the media came in droves; and now it is something like a ghost town. I know on television the newscasters use solemn tones and long faces when they speak of the violence, wreckage, and misery in people’s lives, but hold it a second, there is a little conflict of interest here. The more shocking the news, the more viewers. For them, let's be honest, it was something of a windfall. Business booms when disaster strikes, and if they can dress it up a bit… more viewers and more coverage. I think they actually do a lot of additional harm because they can't help showing as much of the worst as they can gather up. It will keep many people away from Phuket for years and years. The fact is that much of Phuket is untouched. I would say 90%. The big hotels are set back from the beach, so they were not affected. Yes, there are exceptions. But if people watched too much TV, they would think Phuket has gone thru WW III. No, the actuality is that the wounds have been attended to and the cheerful Thai people need to pick up, have dignity, and move on. They need people to come. But the media and the tourists have stampeded out. I spoke to a taxi driver. He said, "Tsunami never happen in Thailand before. Never. First time. In Indonesia yes, but Thailand no." To hear him say this gave me the chills. I imagined the people who died or got close to dying with no idea that the ocean might suddenly rise up. There have been others and there will be others, but an event of this power, a 9.0 magnitude earthquake that would do this again, may not occur for another 300 years. A massive Tokyo earthquake will happen; San Francisco will certainly meet a terrible quake some otherwise ordinary morning; but here in Phuket, it probably it will be centuries before something this big happens again. The taxi driver convinced me to take a longer trip to the north outside of Phuket Island to see some towns along the Thailand West Coast that were hit much worse. Yesterday he picked me up and we drove north. This whole part of Thailand reminds me of Baja Cailfornia. Many many poor town and countless little roadside resturants. Tables and plastic chairs out in the open. Many motorbikes with two riders. Coca Cola and other soft drink advertising everywhere. To the north, about ninety minutes’ drive, the destruction was of a whole different order. The ocean had swept in a long long way, bringing wreckage everywhere. This has more the look and feel of a war zone. I noticed elephants at work pulling fallen trees. Trucks and tractors were working en masse to clean up the mess. We stopped at a lookout where we could see how the ocean had chewed away buildings near the beach. Nearby there was a bulletin board with pictures of victims. Goodness, that was strong medicine. I glanced ever so briefly before I had to turn away. It was just too horrible to look at. Back in the taxi it occurred to me I'd never seen so many dead people at one time (although only pictures of them). It is if, for its own protection, the mind really doesn't have the tools to understand this size of a tragedy. We hear numbers and see pictures on TV, and it is there but not there. To make an instant inventory — Phuket: mildly hit; cities without a protective bay to the north: slammed hard; India and Sri Lanka: very bad; and Aceh, the tip of the Indonesian Island of Sumatra: unbelievably obliterated. What moves me the most is how people have come together to help one another. The amazing capacity of empathy, compassion, and willingness to put down what you're doing and help. Rather than a prayer, I would offer a meditation. There are few times and few places in this world where the widespread destruction, death, and wholesale pain is so great. It causes me to think of all the atomic weapons America is holding to the world's head, which can each and every one inflict this scale of destruction (and far more). The power of these human inventions to destroy ordinary lives, like the ones lost here in Asia, should be something we all think together about eliminating. This kind of power and the long-term survival of human beings are simply not compatible. Maybe you think the connection is unfair or labored... but if you stood with me looking at those victims’ pictures, you too would most likely think that we should do everything we possibly can to prevent such destruction from ever happening again. It is something we can hold hands and strive for together. Understanding that was worth the trip.